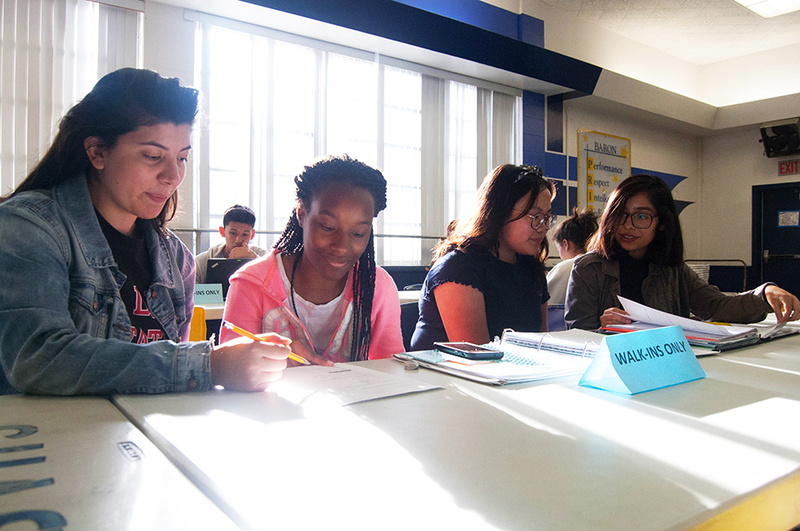 MSTI tutors Zahira Chayeb and Miriam Maldonado work with BVH students at a TEAM tutoring session. TEAM tutoring meets after school in the cafeteria. It’s your final period, the end of the day is so close you can practically taste it. Then there’s the teacher. It’s an important class in which you should focus, but every word they speak seems to fly past your head. To your ears, it’s only noise you try so desperately to find meaning in, but it feels as though you can’t understand the ideas your teacher is throwing at you. Then there’s the students around you, the students who work faster than lighting, who can dominate a test that was thrown at them, the only students who can comprehend anything in that class. You look around the classroom, hoping to spot at least one or two confused faces that are all too familiar to you, but there are none. Just at that moment, you realize you need help. This is why there are people around the globe who have been trained to help those students who need it so they can succeed in their education. These people are known to the world as tutors, and a recent partnership between San Diego State University and BVH’s TEAM tutoring is bringing SDSU students to BVH’s campus as tutors to help those struggling in different level science and mathematics courses. “Our goal is to not just give the students every right answer necessarily but to ask them questions to get them to find the answer themselves. If we give them the answer, there’s no point to it. They have to think about it themselves and then if they’re stuck, then we try to help them more,” Math and Science Teacher Initiative tutor and SDSU student Miriam Maldonado said. Both Maldonado and fellow SDSU tutor, Zahira Chayeb have recognized the mutual benefits for tutors and students that the program offers, whether it be extended to aid in math and science for students or a job with a flexible schedule that offers an insight to the teaching world for tutors. “MSTI stands for Math and Science Teacher Initiative and it’s essentially a tutoring program for people who are in the STEM [Science, Technology, Engineering, Mathematics] field and who hope to become educators It gives them experience in education and encourages people in the STEM field to become teachers,” Chayeb said. Math teacher Esmeralda Orozco, who is in her first year at BVH, established MSTI at BVH due to her connections with SDSU professors she made while participating in a fellowship. The purpose of the program is to fuse SDSU’s science and math colleges with the teaching colleges. “We should hopefully be starting soon, and started this process in July, and its November but we’re still waiting for them to be cleared. So that has been our biggest challenge,” Orozco said. There have also been student tutors from other schools that have applied to work at BVH, such as students from Southwestern College. However, while SDSU tutors are paid for by SDSU, SWC tutors come out of BVH’s budget. According to Orozco, the SDSU student tutors haven’t been here long and there are not very many of them here as of now, but they have already begun making their impact on BVH and it’s students academically, and have encouraged other students from SDSU, as well as other big schools around San Diego, to work with BVH students.